The "epitome of next generation graphics cards"
MSI has announced its R6800 series of graphics cards, supporting the latest HD 6850 and HD 6870 chips from AMD, calling the new arrivals the "epitome of next-generation immersive gaming-graphics cards." AMD's newly announced 6800 series means that a number of the main graphics cards manufacturers will be making announcements of a new series of DX11 cards. "The world-class mainboard and graphics card manufacturer MSI officially launches the R6800 series of graphics cards supporting DisplayPort 1.2 and HDMI 1.4a outputs," stated MSI. "MSI introduces two models, the R6850 (R6850-PM2D1GD5) and R6870 (R6870-2PM2D1GD5) using the new AMD Radeon Barts GPU. "New stereoscopic 3D formats are supported and AMD Eyefinity technology allows you to connect up to four displays on the R6870-2PM2D1GD5, providing a unique visual experience. "The new MSI R6800 series of graphics card are supported by MSI's exclusive Afterburner software, allowing fan speed control and a multitude of settings profiles to be saved. 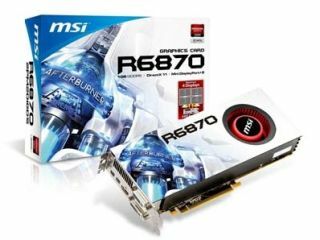 "The MSI R6800 series are the epitome of next-generation immersive gaming graphics cards."